An attractive, well-balanced smile has the power to convey confidence, success and beauty. With today's advancements in modern cosmetic dentistry, patients have more appealing opportunities to achieve the smile of their dreams. At Riverheart Family Dentistry, we proudly offer porcelain veneers as the perfect solution for an instant smile makeover. With minimal office visits, Dr. Schwarz can transform your flawed smile into one that you can be proud to show off. In fact, cosmetic veneers can even take years off of your appearance. 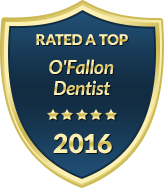 Our practice is committed to providing state-of-the-art dentistry in a comfortable and rewarding environment. We proudly offer porcelain veneers and other cosmetic dental treatments that deliver the most natural-looking and long-lasting results possible. While veneers are an appropriate solution for many patients, they may not be best suited for those that have large gaps, severe overcrowding or other complex smile flaws. Regardless of what is causing you to hide your smile, however, you can trust Dr. Schwarz to work diligently with you to find a solution that will address your concerns at your desired level of comfort and expense. Our O'Fallon practice offers a full range of restorative and cosmetic dental services, ensuring we can address all aspects of your smile at any stage of life. Contact Riverheart Family Dentistry today to learn if porcelain veneers are right for you. To help you afford your smile makeover with porcelain veneers, ask us about our financing options.